You’ve got your phone and tunes, a travel mug full of coffee, and (probably) a spare tire in the trunk—but we’re here to talk about your roadside emergency kit. Oh, you don’t have one? 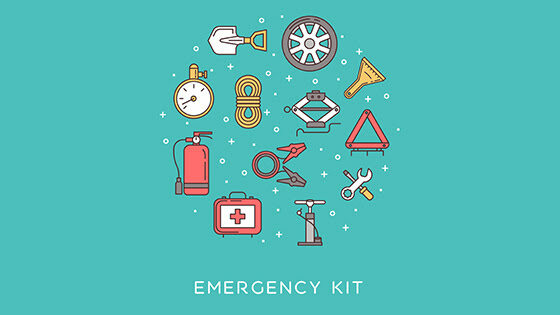 Like thousands of other Americans and Kansas Citians, your lack of a car emergency or safety kit is fairly typical. 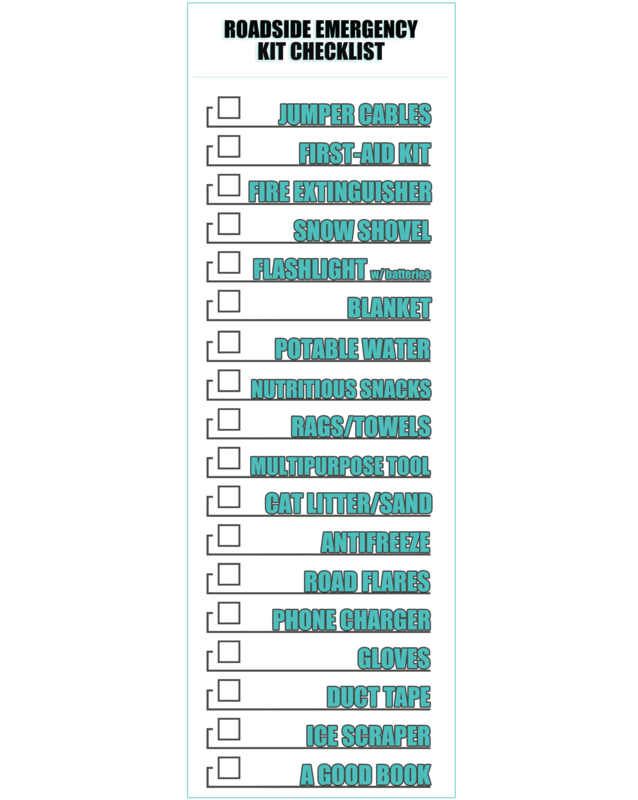 Most drivers don’t even have jumper cables stored in their car, let alone a full emergency kit. You can imagine how problematic that can be, especially in the winter. Jumper Cables A long pair of jumper cables is essential for any emergency car kit. Try to have at least 15-feet of cable to work with—just in case. First-Aid Kit You don’t need a fancy medic bag, but your first-aid kit should be well equipped. Include Band-Aids, antiseptic, tweezers, bandages, gauze, super glue, and aspirin. If you have severe allergies, your first-aid kit should also include epinephrine to treat allergic reactions. If you suffer from other common illnesses like diabetes, be sure you have an adequate amount of medications available. a shovel. If you get stuck in a snow bank, a shovel might just be the only way out! work gloves. Again, being stuck in the snow going mean you have some cold, cold digging ahead of you. Or even if you simply need to change a tire or refill your oil…work gloves are a welcome tool! two quarts of oil. Sometimes all your car needs is a little lube to keep things running smoothly. If you car breaks down, always check your oil levels and refill as needed! jumper cables. Perhaps the easiest way to get out of a broken-down car situation is to jump the battery with jumper cables. You’ll be lucky if that’s all it takes to get you going, so don’t be without them! flashlight with extra batteries. If you need to conserve gas and battery, you may be stuck in the dark night. Hence, the flashlight. battery powered radio. A radio or walkie-talkie could be your ticket to help getting out of the mess you’re in. extra stock of antifreeze. If your car is low on antifreeze, it’s always good to have some extra stock on hand to cool the engine. water. This is another key item to cool your engine down and get your car to safety. snack food including energy bars. If you end up stuck for longer than you could’ve imagined, you sure be grateful to have some snacks on hand. It could save your life! raisins and mini candy bars. These high-sugar items can keep your body going even if you haven’t had much else to eat in days. matches and small candles. These items will come in handy for light and for warmth! extra hats, socks and mittens. We’re talking about a snow safety kit, so of course we’re going to include essential warm-weather clothes. First aid kit with pocket knife. If you’re stuck in the snow because of a car accident, you’ll sure be glad to have a first aid kit. Necessary medications. When stranded for hours or days, the need for medication may come up – even if it’s just to cure a headache! blankets or sleeping bag. These essentials will keep you from getting frostbite or hypothermia in the night. tow chain or rope. If another car passes by, they just might be able to pull your car back onto the road with the help of a tow chain. road salt, sand, or cat litter. These are key elements from providing traction for your car wheels to assist in getting out of that snow bank! brake fluid. When the brakes go out, you’ll want to give them some love with an extra supply of brake fluid. emergency flares and reflectors. Flares can keep you out of harms way if other cars are on the road, and draw attention to bring you to safety! fluorescent distress flag and whistle. 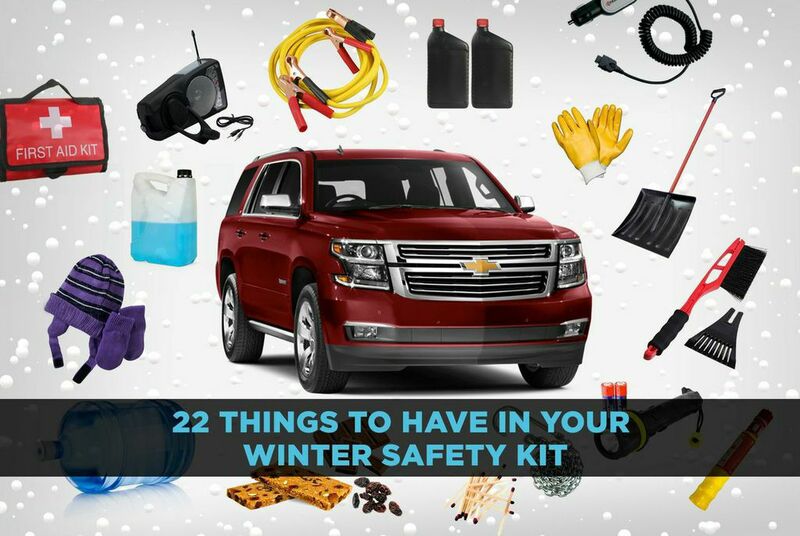 These items can also help bring attention to your car and get the necessary help.